Capt. Pike is held prisoner and tested by aliens who have the power to project incredibly lifelike illusions. From reading the Wikipedia entry, this was the pilot for the show, but "too slow and cerebral" and NBC ordered a second pilot for Star Trek. The Cage wasn't released until 1988 and only two cast members from this show carried over to the regular cast. This post kicks off Star Trek Saturdays, as I intend to watch all 79 episodes of The Original Series and post a new episode every Saturday. Man, that was a weird episode, and I can see why NBC would call for a new pilot to be filmed. For 1965, this episode was expecting viewers to accept a lot of new concepts that probably seemed pretty far out there at the time. They had a computer controlled ship that allowed them to beam anywhere they wanted, they had small communication devices never seen before, and then they were confronted with aliens that could read minds and produce illusions to humans. Considering what normal 1965 shows were like, having a weird universe that could produce meta-universes by reading people's minds to the point they couldn't tell what reality they were living in was pretty cerebral for TV. This episode was pretty slow with not much action going on and a plot that slowly gets revealed as an alien race wanting to imprison Capt. Pike to produce a new race of slaves. It was interesting, but in the end kind of boring and I could see why NBC passed on it. I'm looking forward to the regular cast in future episodes, the pilot cast was mostly unnamed and unremarkable. I am glad that they re-cast the show after this pilot but I do wish that they'd kept Majel Barrett as Number One. I've heard a couple of different versions of the story: in one, the network honchos were dead set against Number One, period. Another version says they told Roddenberry he could keep Number One or Spock, but not both, and he chose Spock. Anyway (and this part I heard Majel herself tell at a con many years ago), after it was recast, she got her hair cut short and dyed blond — without telling Gene. And she came into his office, or walked by him (my memory is a bit fuzzy on this point; as I said, years ago). He didn't pay much attention at first. After a few minutes, he gave her a long hard look, and finally said, "Majel???" She said, "If you didn't recognize me, they won't recognize me." Which is how she got a recurring role as Nurse Christine Chapel. The Cage introduces one of my favorite pieces of Star Trek background music. I agree that the episode was slow and probably more high concept than NBC was willing to mess with in Primetime, but I was impressed with the amount of world building that took place in the first few minutes. The writers were able to establish the main tenants of the show without voice-overs, etc. We got to see the main pieces of technology that run through the entire series (transporters, the communication device, the starfleet logos, the basis for future starfleet uniforms). Not a bad episode but I enjoyed it more out of curiosity than the actual story. I was thinking about doing a rewatch of ST:TOS and I started with the pilot. I hated the end so much I had to take a break from the franchise. The whole point of the episode seemed to be that humanity was about experiencing the risks and pains of freedom because that's what makes life meaningful. Then at the end there's this big caveat: 'Unless you're a woman with an unappealing appearance. Then you're much better off cocooned in a fantasy existence where you get to be beautiful. Real life is for men and pretty women.' Ugh. Also, there's nothing stranger than that moment when Spock listens to the flowers and smiles. You will never see such a broad, genuine looking smile again for the entire show or history of the character. The way the doctor came into the captain's orders to serve a cocktail, also struck me as interesting. And, incidentally, we have our very first introduction to the Orion slave girl. I definitely liked Barrett as the second-in-command and wished we could have had our cake and eat it, too (keeping Spock just as the science officer). I can't remember the date, but I saw this well before 1988. Gene Roddenberry was on a speaking tour for... something, and he brought along a couple reels, including outtakes and this pilot. It wasn't in the greatest condition, either, but it was watchable at least. This would have been sometime between Khan and Spock, but I suspect it was a regular part of his repertoire for personal appearances well before then. Seeing it then (after having watched most of the episodes) was a very different experience than you're getting, watching it first. Without the benefit of the internet and rabid fandom (at least where I was), I had no idea the "other" scenes in The Menagerie were part of something else. Seeing them played out as a full episode was a weird flashback experience, a window on an alternate universe like watching the Eric Stoltz Back to the Future footage. I can't imagine today there will ever be a comparable experience. I look forward to reading the first-time reactions people have to the rest of the series. Thanks. Salamandrous, that wasn't the only such thing either - for example Pike's statement near the beginning, regarding the yeoman, that he can't get used to a woman being on the bridge. In fairness there, they did show the unfairness of the statement via Number One's reaction, and even showed the unfairness of Pike's subsequent "clarification" that it didn't apply to Number One herself because she is "different". For that matter, it's kind of weird that of the three female main characters, two of them don't have names. On the other hand, one little bit along these lines that struck me as actually better than a similar thing in TNG: When Pike and Vina were being attacked by the illusion of the Rigelian barabarian, Vina picked up weapons and used them against the barbarian to try to defend herself. It reminded me of an episode of TNG where the crew was in some sort of medieval world (maybe stuck in the holodeck?) and a fight breaks out, and Picard and Riker and so forth defend themselves with swords, but Troi and Crusher, in classic "damsel in distress" fashion, pick up vases. But that one little "Vina defends herself sensibly" bit aside, yeah, there were some pretty sexist things in the cage. And, frankly, there's worse to come in future episodes. So maybe your idea to stop watching is a good one. But you might want to consider: This episode had a female first officer, shown actually giving orders to everyone but the captain. In broader scope, the series also had a black female bridge officer, an east Asian bridge officer, and a Russian bridge officer at the height of the Cold War. It featured two of the first interracial kisses in US TV history. All of these were conscious decisions by Roddenberry, and this was in the 1960s. He had to fight the network for each of them, against dire warnings that the country would hate it, and that corporate sponsors would leave. Star Trek has made a lot of mistakes and missteps along these lines, and I'm not excusing them. But at the same time, it was out ahead of its time fighting the good fight. Yeah, I was going to say the same thing. Also, even when he's not grinning ear to ear, the whole "Captain! I am excited and yelling!" thing was weird. Unless you're a woman with an unappealing appearance. Then you're much better off cocooned in a fantasy existence where you get to be beautiful. Real life is for men and pretty women. I understand that watching this as the first episode of the series is off-putting, but the rest of TOS is a totally different ball game. OTOH, I think Jeffrey Hunter as the captain would have been preferable to Shatner. Personal taste, I suppose. And I'm pleased that we got to keep both Nimoy and Barrett. Hunter is probably best known, for those of us who liked him, as Christ in King of Kings. Christ died so Shatner could live? Along those lines, does anyone know why Kirk is not named Pike? Were they actually thinking "Maybe we'll use shots from The Cage in a 'real' episode, which has a different actor, and so the captain of the real show better not be the captain of The Cage"? Or was it more just "Ehhhh, 'Kirk' sounds better" or "Test audiences didn't like the name 'Pike'" or some such? I have been enjoying Mission Log Podcast along with rewatching TOS episodes. They're not spoiler-y, and they have a policy of not jumping ahead in the timeline (though they don't always follow that). It's produced by Rod Roddenberry, and that last name might ring a bell. Plus, they start with The Cage. "they'd have better luck crossing you will a computer"
I love Number One. I love how easily she just goes "Welp, I'm not gonna stick around here" and starts setting her phaser to overload. I love how commanding she is. And I love her nail polish. Good god, I love her nail polish. I know this seems like a ridiculous thing to focus on, but one of the problems with "The Cage" (for me) is how drab it all is. The uniforms are that hideous browny beigey whatever or that pale boring blue grey. The rocks and the set are all brown. The Talosians are wearing sparkly robes, but they just fade into the background, because they're a weird off-white/blue. Even Pike's imaginary worlds are still very very brown. Sure, it makes Vina-as-Orion-Slave-Girl stand out, but it's still so very very brown. Then there's Number One's metallic green nail polish. And it's a burst of colour. Probably non-regulation colour. Probably her one defiance against Starfleet's boring beige existance. But by God, those green nails are awesome. When I went through Star Trek earlier this year, I found Kethinov's site useful for following along. "I love Number One. I love how easily she just goes 'Welp, I'm not gonna stick around here' and starts setting her phaser to overload. I love how commanding she is." I've never gotten around to watching The Cage, but Number One's self-assured competency and commanding persona has always been one of my favorite things about The Menagerie. I say that as someone who watched the show in syndication through my entire childhood, watching almost all episodes countless times, and I almost certainly watched at least some of the season three episodes when they aired (I was four). But Number One has always stood out. I also wonder if the TNG writers used this episode to work out the idea of the Borg. There is an assimilate reference towards the end. Might be stretching but I thought it odd. Without wanting to snark, derail or ride my hobby Horta, this suggestion somewhat overlaps with the pervasive "Star Trek invented mobile phones ex nihilo" meme. Surely Space Walkie-Talkies being used by the Space Navy wouldn't have seemed that outre a concept in the mid '60s? The other stuff mentioned though would be a hell of a lot to take in for a first episode, thinking about it. Also, fake as it looks, the throbbing of the Talosians' heads always slightly sickens me. Body horror-lite. Yuk! Benway, what was the assimilation reference? I must have missed it. If it was just the that the word "assimilate" was used, though... yeah, that seems like it might be stretching it to me too. I didn't get any Borg vibe from the episode. "Without wanting to snark, derail or ride my hobby Horta, this suggestion somewhat overlaps with the pervasive "Star Trek invented mobile phones ex nihilo" meme. Surely Space Walkie-Talkies being used by the Space Navy wouldn't have seemed that outre a concept in the mid '60s? The other stuff mentioned though would be a hell of a lot to take in for a first episode, thinking about it." Yeah, communicators were no big deal because, as you say, walkies-talkies were common by that point (much more common than now) and the communicators were not that much smaller. Much longer distance, though, but that is an intuitive extrapolation. I don't think the other things would be that incomprehensible to audiences at the time, either. Both the earlier shows, Twilight Zone (1959-1964) and The Outer Limits (1963-1965), utilized very mind-bending science-fictional ideas. Lost in Space (1965-1968) had an intelligent robot; and generally the fifties and sixties represent a high-water mark for science-fiction that included futuristic technology. My intuition is really the opposite of Matt's in that I think those audiences then were more primed for and accepting of the kinds of things he mentions in fiction than today's audiences. Technological change was faster and more far-reaching, overall, during the thirty years of 1940-1970 than it has been since; and this is particularly so with regard to computing, transportation, space, weapon, and communication technologies. Futurists regularly imagined a very rapid pace of technological change and extrapolated with regard to those technologies. In that sense, Star Trek is quite in line with this. People today might think this isn't true about computing -- but the change we've seen from 1970 to the present is really about miniaturization and ubiquitous computing and, especially, networking. But computing started from almost nothing during WWII and over that period eventually affected most everyone in one way or another, as much of the deeper infrastructure of society depended upon mainframes, somewhere or another, doing crucial work. Everything from actuarial analysis to payrolls to weapons design to solving manufacturing logistical problems. People were aware of this, there was a sense that big computers somewhere were slowly taking over everything and that's why the whole dystopian paradigm about computing during this period was the idea of a huge computing overmind dominating society. We've kind of come full-circle with things like Person of Interest, but that's more a product of the rise of a different technological paradigm, the surveillance society, and is really less about fears of out-of-control computers. Anyway, that's why a (nearly) AI natural language interface monolithic computer would seem natural to audiences of the mix-sixties while it, the concomitant lack of discrete computing devices, and this focus on a spoken language interface all seem very weird to us. What audiences wouldn't be prepared for were the various social changes depicted in the show. This really illustrates the big mid-century divide between the common, popular science fiction in films and television and the most pulp of novels, and more literary science fiction. The latter often was concerned with social change while the former almost without fail would extrapolate a universe that was basically 50s US except with advanced technology and in space. To us, the various social changes depicted or implied seem quite small and can be, in a roundabout way, infuriating when we see how sexist the show was (Number One excepted). But having a Russian as an officer and implying a world that was post-Cold War but not a Pax Americana, was a bit startling, I think. There's very little that's capitalistic about the show. There's a lot of progressive social messaging in the show and that's really kind of weird, when you think about it, in the context of a show depicting a militarized milieu with lots of advanced weapons technology and combat and such. Roddenberry sort of used the familiar reactionary Cold War militarized structure upon which to build subversive social messaging. I'd have to disagree with this, though it does reveal a curious omission in the future tech of TOS. Vina's problems go beyond physical appearances. The brief view of her real self seemed to show someone crippled and in pain because her botched re-construction. I wouldn't be surprised if there was a sexist impulse in the writing of the script, but the scene in and of itself is understandable and somewhat remarkable. The curious omission is in their medical technology. The show presents the 23rd century as a place full of wonders far more advanced than 1965, but a solution to Vina's problems is never offered. You would think in an era of warp drives and transporters and matter replicators that the starship, or a nearby starbase, could provide reconstructive surgery which would restore Vina to a healthy state. throbbing of the Talosians' heads always slightly sickens me. Body horror-lite. That also used to freak me out a bit when I was a kid. One interesting detail about the Talosians: all of the actors playing the Talosians were older women. This was an interesting and, for the time, a somewhat unorthodox casting choice. I had heard the Thalosians were played by teenaged girls. As in, one of the producers supported some girls in the street and asked "Can you act? Would you like to act?" As for Vina, and choosing illusions over reality, note that The Menagerie revisits this question. It's interesting that the choice between reality and illusion is very diferent when one is young and healthy, vs looking at a future as a box with a blinking light. According to this page (Red Alert: autoplaying audio), the Keeper was played by Meg Wylie who would have been 48 in 1965. But looking at a promo photograph of the Talosians, one of them does look young. So, looks like we're both right. Who knows how long ago was the last time I watched The Menagerie (probably not that long ago, really, in middle-aged-guy-years) but, wow, I immediately and strongly recognized Wylie as the Keeper from her IMDB photo, no pulsing brain bulges required. I just finished listening to the Mission Log podcast that it must be bunnies suggested, and found it entertaining and well put together. Thanks for the submission it must be bunnies! He had to fight the network for each of them, against dire warnings that the country would hate it, and that corporate sponsors would leave. Not each of them. Chekov was Russian by his idea, but a youthful Monkees-esque character by the network's. The controversy, however, was ginned up for TV Guide and the newspapers, and it worked. She said, "If you didn't recognize me, they won't recognize me." An alternative narrative, again, is that the first time they screened "The Man Trap", one of the executives -- well aware that she was Gene's girlfriend -- crooned from the darkness, "Well, looooook who's back!" Along those lines, does anyone know why Kirk is not named Pike? I don't have a definitive citation, but they had a bunch of mooted "Captain-y" names. It was mostly, though, that Jeffrey Hunter wasn't available for the second pilot and they had to part ways. It dovetailed neatly with the way they developed the universe-building, especially when putting together "The Menagerie", but there really wasn't any concrete plan. It was just one of many tweaks as they tried to make a more appealing show that would get picked up. The uniforms are that hideous browny beigey whatever or that pale boring blue grey. Yes, they consciously brightened up the uniforms to work better on a small TV screen. (The influence of Forbidden Planet is most apparent in this episode.) As an aside, when rewatching this myself I was struck by how much the away team field jacket resembles the modern US military combat fatigue blouse. I also wonder if the TNG writers used this episode to work out the idea of the Borg. Maurice Hurley had an idea for a more threatening alien species that was insectoid with a hive biology. They became cybernetic largely for budget reasons. Of the Talosian actresses, Serena Sande would have been the youngest, at 35. No teenagers. I agree with Ivan that this was indeed an era of wiz-bang technology and audiences would not have had a really difficult time with its depiction in Star Trek. (Good grief, The Jetsons debuted in 1962.) Don't forget that space-set stories had been among the earliest television series -- Captain Video; Tom Corbett, Space Cadet; and Space Patrol [note communicator and phaser, er, space-o-phone and ray gun], not to mention adaptations of Buck Rogers and Flash Gordon, both of which had decades of presence in the comics pages. 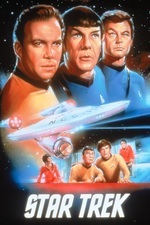 The innovations were largely that Roddenberry melded the adventure serial with the anthology ("Wagon Train to the Stars"), and injected some forward-thinking social commentary (although even this wasn't particularly new). Roddenberry explicitly didn't want to do a show where the technology being futuristic was the main focus, though -- he didn't want to have a policeman explain how his gun works before he used it, he just wanted him to use it. (That was the way he thought about things; for example, the transporter was largely a time-and-money-saver.) I think these were key ways in which Star Trek became a much better and, as it happened, enduring concept. He also very fortunately sought out telescripts from real SF writers such as Sturgeon and Matheson. Yes, they consciously brightened up the uniforms to work better on a small TV screen. Well and the network was trying to promote color TV and wanted it to really show off the colors. Ok, I am a week late but I finally managed to watch this. It is my first time watching it, and my first time watching anything Star Trek that wasn't a feature film. Because of its age, I expected it to be much worse than it was, and I actually thought it was mostly pretty good. A few things that I thought were pretty funny, were the communicators made out of cheese graters? If you are the captain of a giant spaceship, why do you have such a crummy twin bed? I could see the individual springs when Pike sat on it in the scene with the doctor and the drinks. Also, pulsing veins in giant heads? Ewwww! One thing that I thought was kind of dumb was the human lady that stayed said something like "they had never seen a human before so didn't know how to put me back together." But the big heads were clearly humanoid and so was the ape-pig monster and the rooster monster (or whatever it was) that you saw for a second. I know that this was made on a budget and is old, so it wasn't an option to crank out some CGI non humanoids, but couldn't they have thought of a better excuse? Like that she was so badly damaged it was just the best they could do or something? Well, whatever. I will try to watch the next episode tomorrow and then be caught up. Wish me luck! Oh and one kore thing. Rodenberry's introductory speech was really bizarre. For a guy who spent so long making television, he seemed to have a really hard time finding the camera and talking into it. It was cringeworthy. I don't have a definitive citation, but they had a bunch of mooted "Captain-y" names. As I recall, there is a memo reproduced in one of the thick seventies paperbacks on the behind-the-scenes stuff (either The Making of Star Trek or The World of Star Trek) which listed five or six possibilities for the captain's name. They fell into two general categories: items suggesting frostiness (North, Winter) or the clipped k-sounds (Pike, Kirk), as well as the odd man out April. April later became the quasi-canonical first captain, the Roddenberry's fondness for the k-sounds surfaced again two decades later with Picard and Riker.